What would you pay for hybrid poplar biofuels? Are they sustainable? After five years of the AHB project, the Extension team was curious how project members were feeling about the sustainability of poplar biofuels and how much members would personally be willing to pay to use those biofuels. At the recent AHB annual meeting in Walla Walla, WA, we took the opportunity to ask those questions. We asked project members, the advisory board, students, and USDA representatives to complete a short survey on their willingness to pay for more expensive gas and airline tickets and their thoughts on how to make poplar biofuels more economically viable. Advanced Hardwood Biofuels Northwest (AHB) partners come together at Walla Walla Community College for the 2016 Annual Meeting. With the price of oil so low, many are apprehensive about the viability of alternative fuels. We wanted to see whether AHB members, an arguably biased group, would be willing to pay more for hybrid poplar biofuels. How much more would you be willing to pay to fill a tank with hybrid poplar biofuel instead of regular gas? Of the respondents, 65% said they would be willing to pay between $0.01 to $5.00 extra per tank. However, several respondents expressed confusion at the wording of the question. We tried to clarify by highlighting key words on the survey. Later analysis did not reveal a statistically significant difference in responses between the groups that did and did not received the highlighted version. This could mean that relatively few were confused or that everyone continued to be perplexed, regardless of highlighting. How much more would you be willing to pay per ticket to fly on an airline that uses hybrid poplar biofuels? Of the respondents, 74% would be willing to pay either up to $50.00 or between $50.00 and $100.00 extra for a plane ticket, with slightly more attendees saying they would pay up to $50.00 extra (39%). Again, we found no difference between the groups that received the highlighted and plain surveys. 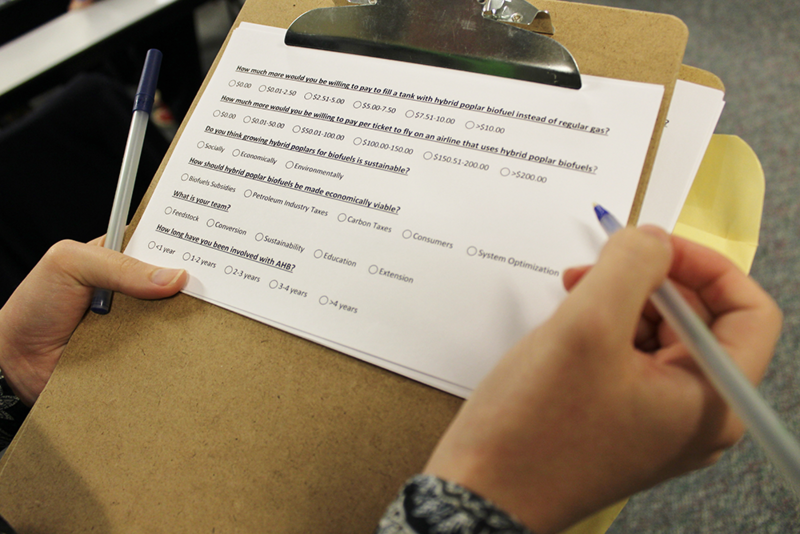 The Extension Team asked participants of the 2016 AHB Annual Meeting to fill out a survey. Do you think growing hybrid poplars for biofuels is sustainable? The majority of people at the meeting thought that growing hybrid poplars is socially and environmentally sustainable (75% and 85%, respectively). Some respondents added caveats, saying sustainability depends on location and a variety of other factors. However, only 33% indicated that it is economically sustainable. When designing the survey, we suspected many respondents would think hybrid poplar biofuels are not economically sustainable. Therefore, we asked how society should strengthen the competitiveness of hybrid poplar biofuels. How should hybrid poplar biofuels be made economically viable? The only option that was consistently flagged as a good idea was carbon taxes, with 67% of respondents supporting it. The attendees at the meeting also agreed that consumers were not the answer to economic sustainability, with only 18% in support. Respondents were evenly split on the other options. Several people suggested that instead of taxing the petroleum industry, we should remove their industry subsidies. We found it interesting that project members were so divided on most of these options. 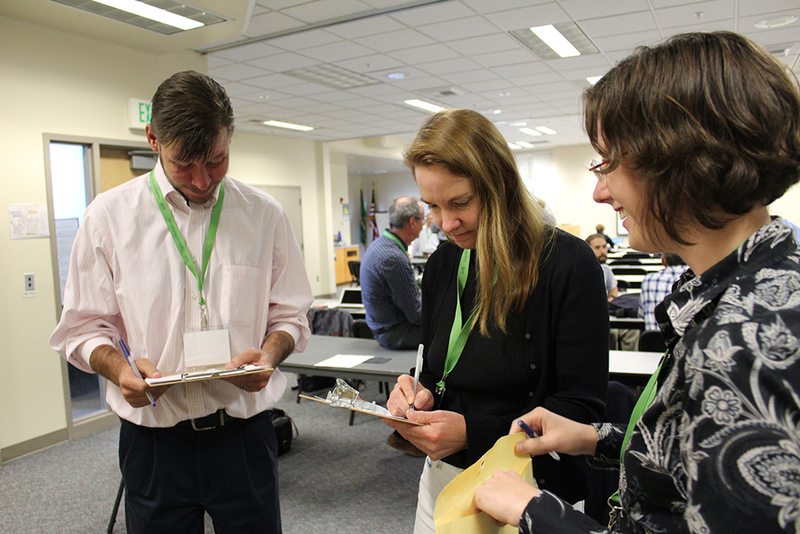 Daniel Cassidy, USDA NIFA, and Patricia Townsend, WSU Extension, provide Cat Gowan with survey data during the 2016 AHB Annual Meeting.